Continuing my adventures in costumes involving glue, synthetic trims, and metallic paint, I helped Mike make a new costume for the Penny Arcade Expo East (PAX East) convention. 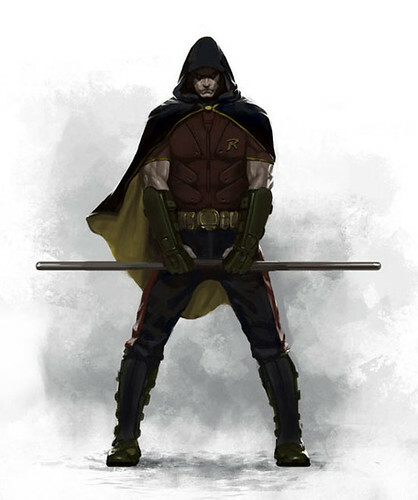 Mike chose to make Robin from the Batman: Arkham City video game. 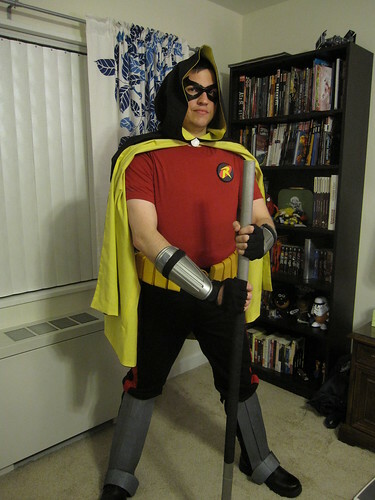 I sewed the cape, sewed red trim to the pants, constructed the belt, and sewed the logo on the shirt. Mike made the staff and the utility pouches for the belt. Together we built the armor, using soccer shin guards for the arms and craft foam for the legs, which we then painted silver. The boots and mask were purchased. The latter from Ravenwood Masks. Would it be possible for me to buy this off of you? Sorry, as a rule I do not sell my costumes. Thank you! Your mask has worked out great, Alyssa! I may be purchasing more from you in the future.